Is the FDA Done Playing Catch up to Digital Health? Many products and services fall under the large umbrella of digital health. Things such as mobile health (mHealth), telemedicine/telehealth, health information technologies and wearable devices are all included under the CDRH’s (Center for Devices and Radiological Health) broad scope of digital health. So, why is this important? Thanks to the amendments made to the Medical Device User Fee earlier this year the FDA is launching a unit specifically dedicated to dealing with digital health and telemedicine regulations. Its focus is on getting products to the market faster than ever before. Why Focus on Digital Health? Digital health is a rapidly growing field that becomes more competitive each day. It’s not all about the up and coming companies and products/services though. Well-known corporations have been making strides the past couple of years to get involved. Companies such as Google, Apple, IBM, and Samsung have all developed products and services that have given them a foothold in the healthcare market. When large corporations such as these become interested in something you are likely to see huge waves of innovation roll across that field, and that’s exactly what happened. It used to take companies and manufacturers years to get medical devices ready for regulatory approval. In today’s world, it takes only a few months. Most medical devices in the past were heavily hardware based. Whereas now, many products are software based. That coupled with the introduction of artificial intelligence, machine learning powers more devices each year and the CDRH can’t keep up. A product taking advantage of AI has an ever-changing algorithm that is constantly learning, improving, and changing the product; AKA a regulator’s worst nightmare. So how will this new digital health unit combat this? The Associate Center Director, Bakul Patel, said he wants to “start with a clean sheet of paper” when it comes to how this digital health unit will regulate new products. Patel believes that we cannot keep going with the system we have in place now. What we have today and what we are going to have tomorrow is not always translatable. This means taking off the blinders and turning the focus to where we are headed. He wants this unit off of the cliché D.C. time and up to Silicon Valley speeds. Patel envisions this operation rewarding companies that have demonstrated a history of excellence while watching companies with spotty track records or high-risk products more closely. This will compel companies to compete on the level of excellence rather than just compliance with regulations. Patel would like to see this opportunity foster collaborations and enhance outreach to digital health customers and creators. Finding new ways to monitor patients is creating vast opportunities for technology and service providers. It’s now estimated that more than 50% of Americans live with a chronic medical condition, according to the CDC. Big data analysis is playing a crucial role in the development of new digital healthcare services and products to help manage this. New technologies will enable massive amounts of data to be collected on millions of different patients and devices. This data can then be used to analyze different treatment options based on the unique requirements of each individual patient. Telemedicine companies, such as Chiron Health, bring easier access to care, increased patient volumes and engagement and shorter wait times. It enables physicians to make modifications to medications and conduct routine follow-ups over video visits while still getting easily reimbursed as if it were an in-office visit. It will also bring some much-needed relief during the upcoming physician shortage. Lastly, remote monitoring allows clinicians to monitor patients to help prevent medical issues and emergencies before they occur. All of these benefits are starting to get taken advantage of more and more by those looking to save time and money. It is only a matter of time before this is the norm seen around the country and, eventually, the world. This is an exciting time for the field of digital health. New innovations in healthcare are being introduced every day and so far the reactions have been largely positive. Many entrepreneurs and established companies have recognized the numerous opportunities that are available thanks to the exploding digital health market. It’s important that innovators get involved now because it’s not very often that you get the chance to help write the rules that will guide the future. Goldman Sachs recently reported that there will be an opportunity to save $305 billion thanks to telemedicine and digital health. Thus helping to significantly reduce costs and making it easier for millions of patients to access digital healthcare services. The future is coming fast and the CDRH is now on a path to catching up. Interested in offering video visits in your practice? 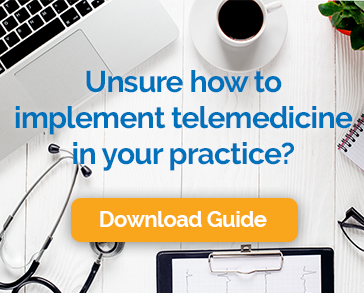 Get started with Chiron Health’s user-friendly telemedicine platform today!